Anna Bailey finally discovers some peace and quiet in her life. A satisfying career as a skip tracer is interrupted when she receives a call from her frantic sister-in-law in Lancaster County. Her beloved brother is missing and possibly in grave danger. Her job experience makes her the ideal person to investigate the situation, but she'll blow her carefully constructed new life to bits if she gets involved. She returns and stays with her sister-in-law's Amish family. Newspaper reporters camp outside the house, making anonymity difficult. Anna reunites with old friends, including the handsome Reed Thornton. Using her skills, she uncovers scary information. Could her brother be a murderer? Her heart says, "no," but evidence is mounting. Will Anna face her past no matter what the cost and find her brother? This is not your usual "Bonnet fiction." The main character is not Amish, but has strong connections to the community. Since my book has that kind of dynamic, it caught my eye. Written in first person, I was immediately plunged into the story. The tension and mystery kept my heart racing. 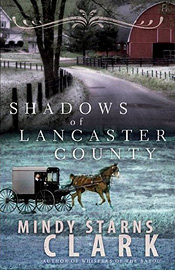 Mindy Starns Clark did a great job intertwining both Amish and non-Amish characters. She combined an unusual occupation, two divergent cultures, and a medical angle that held my attention. Thumbs up for this story. I'm looking forward to reading more of Mindy's books. I'm biting my nails already!! Totally going on my reading list. Piqued my interest as my sister-in-law was recently contracted to write three Amish fiction books through Kregal. This book sounds like a good read! Thanks for the recommendation! Have a beautiful week, Susan! I liked the medical and missing persons angles a lot. I couldn't put it down. Very cool! Does your SIL have a blog? I'd love to check it out. Sounds like yet another good one! Sounds like a good story. Thanks for sharing! This books sounds like it has it all. A murder, family connections, and a romance! Sounds good, Susan! I love a good mystery. Oh, this book sounds really exciting and fast-paced. Win-win! Oh yeah, that definitely sounds interesting! The book sounds very interesting and I love the cover. I have read several Amish stories and would read this one since there is a contrast of cultures. Haven't read this one yet, I may have to check it out. Thanks, Susan, for the info! Thanks for stopping by. This book had an excellent story with lots of tension. You'd enjoy this, especially the medical mystery aspect. It was very well done. Mindy dove right into the action. She did a good job. I hope you give the book a try. I'd read a number of reviews and thought it sounded interesting. The medical angle piqued my interest. I liked how she blended the two cultures. Excellent book. Yes, this is definitely a great addition to the TBR pile.